Thatch is a term used to describe a layer of dead, non-decayed organic matter in lawns that lies between the soil surface and the green shoots or stems. Thatch consists mainly of dead rhizomes, stolons, stems and roots. An excessive thatch layer can weaken a lawn and make it more susceptible to injury by other pests. Examine the lawn closely, regardless of how healthy it appears. Cut and lift several plugs two or three inches deep. Examine the profile of the plug. If thatch is present, it will appear as a distinct layer of stringy or felt-like material (Fig. 1) between the soil level and green grass stems. Figure 1. Photo of cores taken from two bermudagrass turfs. Thatch is the brown layer of non-decomposed organic matter lying between the soil surface and the green shoots. Note the thick, excessive thatch layer in the core on the right. Thatch should not exceed 1/3 inch in thickness in cool-season grass lawns or 1/2 inch in warm-season grass lawns. The best lawn grasses are those that constantly reproduce new plants to renew the lawn. Under favorable conditions, dead plants decompose into fine-textured humus which becomes a part of the soil profile. Any time the decay process is slowed down by unfavorable conditions, thatch builds up. Contrary to popular belief, grass clippings left on the lawn do not lead to thatch buildup if mowing is performed at the proper frequency and height. Participation in the “Don’t Bag It,” “Grasscycle” or “Earth Kind” programs which encourage the recycling of grass clippings back to the lawn through use of a mulching mower or side-discharge mower, should not lead to thatch buildup in the lawn. For more information on not bagging your lawn clippings, obtain a copy of OSU Leaflet L-253: Don’t Bag It Lawn Care Plan at your local Oklahoma Cooperative Extension Service office. The tendency for thatch to buildup varies among lawns. Some lawns never develop a thatch layer while others become thatch-bound within a few years after the lawn is established. • Unfavorable soil conditions that interfere with microorganisms that break down thatch. Rapid and excessive growth caused by over fertilization and excessive irrigation is likely to produce heavy thatch because plant material is being produced more rapidly than it can be decomposed. Infrequent mowing produces long clippings that cannot filter through the grass canopy to the soil surface where they are more readily decomposed. Although grass clippings do not normally cause thatch, infrequent and improper mowing can lead to instances of grass clippings causing thatch problems. Heavy, compacted soils can lead to thatch build-up because these soils do not allow adequate air, water and nutrient exchange that favor microbial decomposition of the thatch. Other soil conditions that are unfavorable for microbial growth can lead to thatch build-up. Soil bacteria and fungi consume thatch as a food source. Some of the most common unfavorable soil conditions that hinder thatch break down include soil acidity and build up of pesticides due to their overapplication. These factors contribute to earlier death of living grass plants. Thus, thatch is both a result of unfavorable conditions and a cause of further damaging problems. Thatch development, especially in bluegrass lawns, may go unnoticed in early stages. Lawns with a thick thatch layer may appear healthy in spring, only to die suddenly in large patches during summer heat and drought. Zoysia and bermudagrass lawns can develop thatch layers rapidly but seldom die suddenly since they are more tolerant of heat and drought. In these warm season grasses, severe thatch usually leads to thin, diseased turf. Very thick layers of thatch may cause uneven and difficult mowing. • Moderate and regular fertilization of the turf to maintain vigor without excessive growth. • Regular mowing that does not remove more than one-third of the shoot growth in a single mowing. • Watering as deeply and as infrequently as possible to encourage a deeper root system. Try to moisten the soil to a 6- inch depth when watering. Wait until the turf just begins to wilt before watering again. • In situations where thatch has been a problem, dethatch annually before the new flush of growth begins. • Core aerification of compacted areas in order to improve penetration of air, water and nutrients. Mowing should be performed often enough that not more than one-third of the shoot growth is removed in a single mowing. This rule of thumb insures that the grass is not stressed by excessive shoot removal and that clippings are short enough to filter to the soil surface where they decay. If excessive shoot growth has occurred, set the mower to remove only one-third of the shoot growth, then delay one to two days before mowing the grass down to the desired height. For a comprehensive discussion of suggested mowing, fertilization and irrigation practices, refer to OSU Fact Sheet HLA-6420, Lawn Management in Oklahoma. 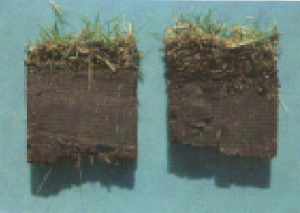 Thatch layers are best removed by a dethatching machine or vertical mower that may be hired or rented. A special dethatching lawn mower blade, which has flexible tines or springs attached to the blade, is also available to fit most rotary lawn mowers. The months of February and March, prior to green-up, are best for dethatching warm-season lawns. For cool-season lawns, late September through mid-October is the best time to dethatch. Cool-season lawns as well as buffalograss and centipedegrass lawns rarely develop thick thatch in Oklahoma. Use moderation when removing thatch from these grasses. Several cultivars of zoysia and bermudagrass are quite vigorous, producing large quantities of roots, rhizomes and stolons which are fairly resistant to decay. Therefore, both have a strong tendency to develop thatch. Annual vertical cutting with dethatching equipment followed by raking and thatch removal is ideal and will improve the vigor of the grass. Aerification is also beneficial, alone or in combination with the vertical cutting and raking. Dethatching isn’t easy work, so make certain that dethatching is necessary before starting the task. Once collected, thatch can be composted rather than bagged and sent to the landfill. In severe situations, removal of thatch by mechanical means also removes most of the living grass. In such cases, moderate treatments over two or three years may be more desirable than attempting to complete removal in a single operation. Any additional lawn improvement practices should be performed after dethatching or aerification. Such operations can be performed on the same day (after dethatching) and may include topdressing, reseeding, fertilization, herbicide, liming or gypsum application.